Welcome to the fourth step in our free professional learning series on building your PLN. In our previous step, we introduced you to Twitter and explained how people use it to build their PLN. Explain what hashtags and Twitter chats are. 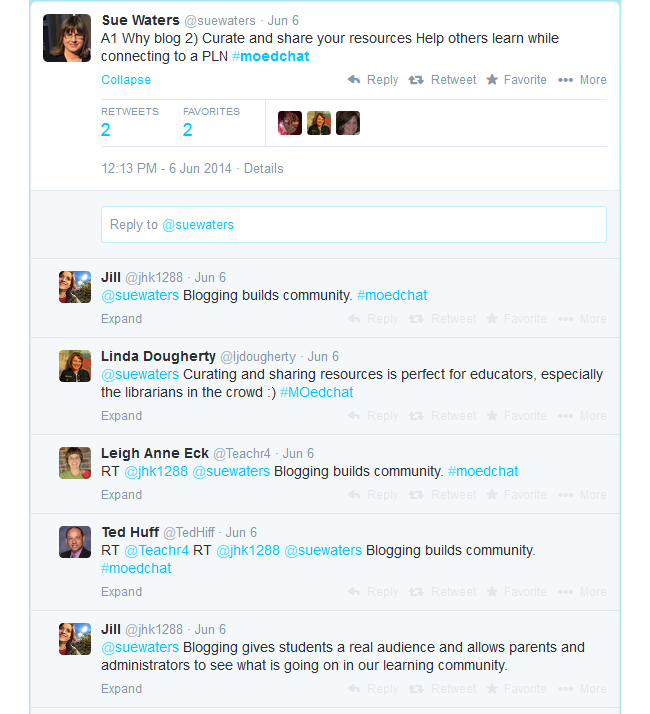 Explain the benefits of participating in Twitter Chats with your PLN. Before we begin explaining Twitter chats, we should break down hashtags which are an important part of Twitter. A hashtag is written with the “#” hash (pound) sign and is used to index keywords or topics on Twitter. Putting a hashtag symbol (#) in front of a relevant keyword or phrase helps to categorize the tweet and make it easier for people to find. Hashtags can be used anywhere in a tweet. They can replace a word as demonstrated below, or just be tacked on to the end of a tweet. When you click on the hashtagged word or phrase (e.g. #podcasts) a new page will load with tweets from everyone who is tweeting about podcasts — whether or not you follow those people. Note that hashtags can’t have any spaces so math chat becomes #mathchat. You can use any hashtag you like, however, if it’s not being used by others then people won’t be following it or searching for it. So to get the most out of hashtags, you should usually use ones that others are using. Note that hashtags are not created by Twitter, but by Twitter users. Often if there is an event going on, the organizers will publish the official hashtag on the conference materials and social media. You can type a hashtagged keyword in the search bar on Twitter to discover tweets and accounts based on your interests. There are easier ways to follow hashtags so you don’t have to keep running the same search. TweetDeck is commonly used to follow hashtags that you want to keep track of regularly (the Twitter search bar is fine if you just want to do one-off searches). Check out this video by Jennifer Fox to find out how to set up TweetDeck to follow hashtags. Hashtags are community driven and anyone can start one. Maybe you want to start your own hashtag with a group of people from your PLN who have a similar interest. 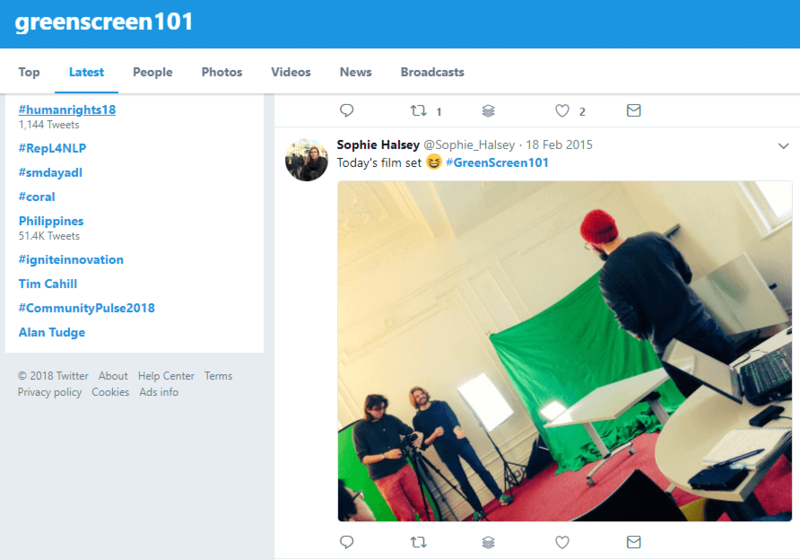 Say you’ve been talking to a group of teachers about using greenscreen technology and you thought you could use the hashtag #greenscreen101 to keep the conversations going. To avoid using a hashtag that is already being used, it’s advisable to search for that hashtag first. Things can get confusing if your hashtag is being used by another group! Simply search in the Twitter search box for your preferred hashtag or use a free tool like hashtagify.me. Here I can see that #greenscreen101 hasn’t be tweeted in a number of years, so it would be fine to use. Kathleen Sokolowski has shared a handy tip about creating your own personal hashtag in order to find tweets that you want to remember or come back to. Read all about it in her article on creating a Twitter Digital Notebook. If you are like me and frequently read articles and posts that resonate, challenge you or speak to you in some way, consider creating a hashtag for yourself! When you want to find your tweet again, just search for your hashtag in the search bar and be sure to click “Latest” to see all your tweets. Maybe you’re a teacher tweeting about the arts. You’d like to include a hashtag in your tweet to reach a larger audience but you’re not sure what the popular hashtags are in that niche. You might have seen #arted used but you’re not sure if this is a popular choice. A tool like hashtagify.me can be really handy (the basic features are free). When I type in #arted I can see that the popularity is 42.7 (on a scale of 1-100). It also shows me a wordcloud of related hashtags. The bigger the hashtag, the more popular it is. #artsed (with an s) stands out. 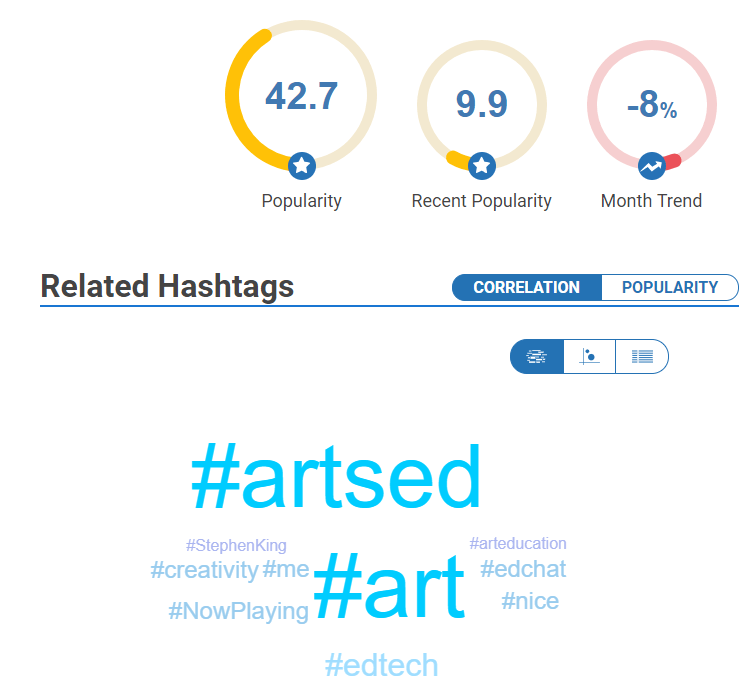 Clicking on #artsed in the word cloud shows me that the popularity is higher (51) and I can also see some related hashtags I could explore as well. Jerry Blumengarten (aka Cybrary Man) is well known for curating hashtags used in education. You can find the complete list on his site. Ryan O’Donnell has also used information from Cybrary Man’s site and the November Learning team to curate a list of popular hashtags in education. When you’re on your Twitter home feed, you might have noticed “Trends for you” on the left hand side. This is located in the search tab of the Twitter mobile app. Trending topics are a mix of hashtags and regular phrases that show what’s currently being tweeted about most. They’re tailored for you based on your geographical location and who you follow. 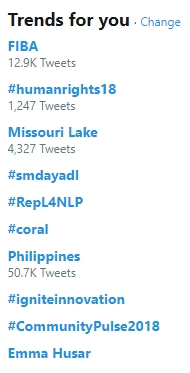 You can click on these trends to find out more and join in the conversation by leaving a reply or tweeting something of interest. As we just saw, hashtags make it easier to search and follow the Twitter conversations on specific topics at any time. Sometimes people gather around to discuss a specific topic at a specific time. This is a Twitter chat and a hashtag is the glue that brings the Twitter chat together. We’ll now take a look at how Twitter Chats work and break down how you can get involved. If you’d prefer to watch a video to learn, this is a great short overview of Twitter chats by The University of Nebraska Medical Center. 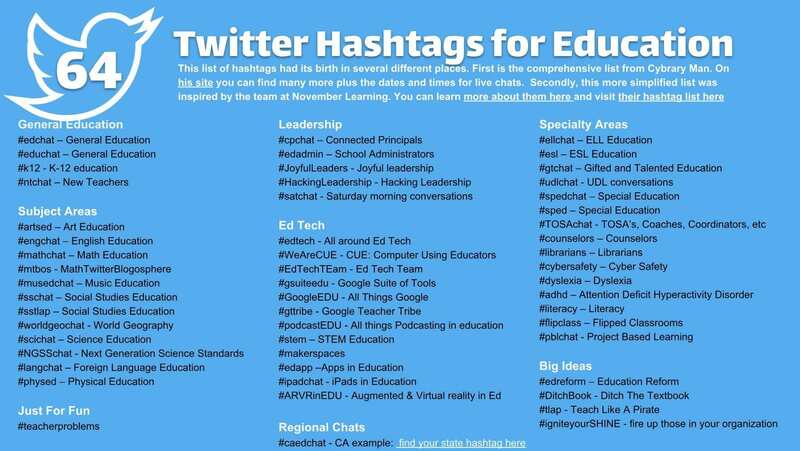 Twitter chats are one of the best ways for educators to connect with other educators, exchange and debate ideas, ask for help and provide assistance, find new resources and take action. Twitter chats are where educators meet at a set “meeting time” to engage in conversations by sending out tweets on a topic using a designated hashtag during a specific time on a certain day. Most Twitter chats last for an hour. During the Twitter chat, you’ll see educators tweet their responses in real time. The best way to participate in a Twitter chat is to set up a search for the hashtag in TweetDeck, Hootsuite, or in the Twitter app on your mobile device. Check out Laura Moore’s video which explains how to take part in a Twitter chat using TweetDeck. The video goes for 25 minutes because Laura has recorded herself participating in an actual chat. You can just watch the first few minutes if you just want to learn how to get set up for a chat. Twitter chats normally have a moderator (or several) who guide the conversation during the chat using a Question and Answer format. Prior to the Twitter chat, the moderators decide on the topic of the chat and organize a series of 5-10 questions to ask during the chat. 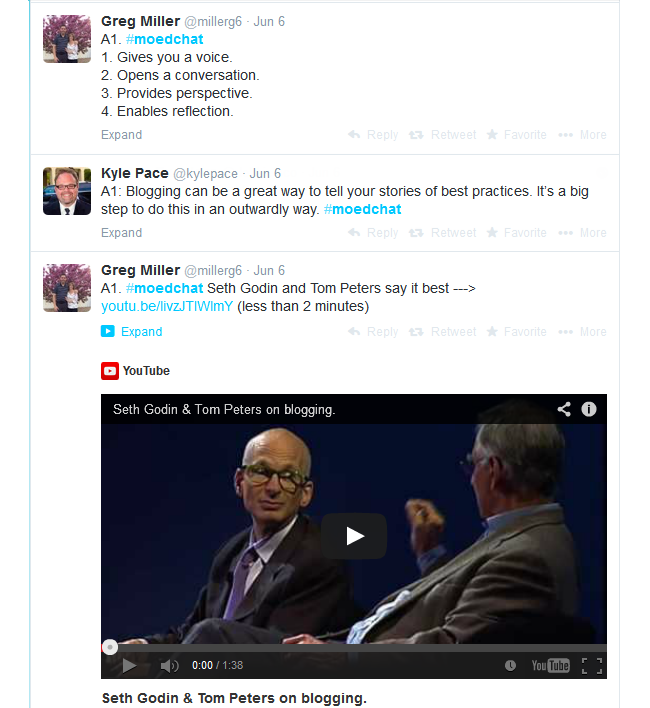 Below is an example of a Twitter chat using #moedchat (Missouri Educators Chat). The chat normally starts by introducing the topic and asking participants to introduce themselves. Participants respond by including the hashtag for the chat in their tweet (in this example all replies include the hashtag #moedchat). Once introductions are finished the moderators will commence guiding the conversation using their questions. Each question is normally starts with a Q and a number to indicate which question it is. Participants’ replies normally start with an A and a number to indicate which question they are answering as well as the chat hashtag. Twitter chats are a conversation — you can add your extra thoughts to anyone’s answer by replying to their tweet and including the hashtag. Provided the hashtag is included, everyone in the Twitter chat will see your reply. Tweets can fly fast in a Twitter chat! Don’t worry if you can’t keep up. Archives: Moderators often archive or curate the information and resources shared during the chat session. This used to be through tools like Storify but this service has closed. Sometimes a tool like Wakelet is now used or there will be a specific website for a Twitter chat. Be prepared: Moderators often publish the questions that will be asked in advance so you can think ahead. You can also get your Tweetdeck set up before a chat so you’re ready to go. Be selective: You don’t need to answer every question. Twitter chats are very flexible. They often go for an hour but no one minds how long you stay or how involved you are. Follow up: If you were interested in what someone had to say but you found the tweets were flying too fast, don’t worry. You can resume the conversation with people at any time. Bookmark: A relatively new feature of Twitter for mobile is Bookmarks. You can bookmark Tweets you’d like to refer to later. Tap the share icon next to a tweet and select Add Tweet to Bookmarks. Tap Bookmarks from your profile icon menu to access your saved tweets. Like: If you like a tweet by pressing on the heart, you can go back and look at these later. Just click on the Likes from your profile icon menu. Lurk: It’s fine to just watch a few chats before you decide to contribute. The first question is generally an introduction so don’t be afraid to say it’s your first time participating either. Education chats generally occur in the evenings each week, either during school terms or throughout the whole year. Most chats focus on a particular topic, subject area, theme, or year level. Some states or countries have their own chats, but anyone is welcome to take part in any chat. Now you know about Twitter chats it’s time to find one and take part! There are many places to find chats that interest you and work with your schedule. Check out the Twitter chat calendar for educators. 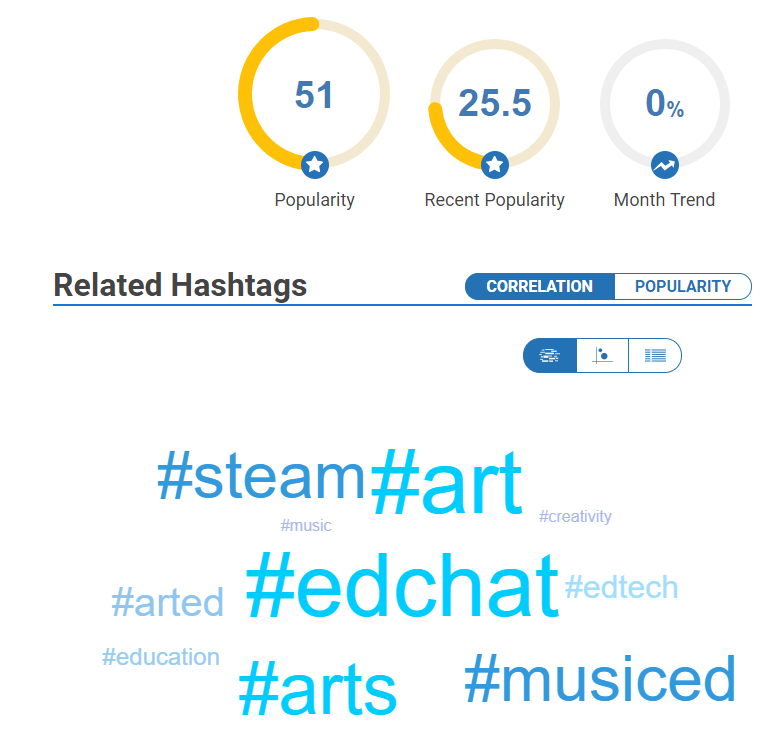 Explore Kasey Bell’s Educational Hashtag and Twitter Chat Database. You can submit your own hashtags too. Participate.com/chats is another place to find educational Twitter chats organized by your timezone. All the times listed below are in Eastern Standard Time (USA). Use this time zone converter to help figure out what time this will be for you. Double check the time by clicking on the links as things can change with daylight savings etc! Please let us know if we have any of the information below incorrect. The “original” education chat. This one is very busy and fast paced. Takes place on Tuesdays 12 PM and 7 PM EST. Learn more here. This chat focuses on educational technology and is held every Monday at 7 PM EST. Find out more here. NT2T stands for “New Teachers to Twitter”. Held Saturdays at 8 AM. For more information, click here. Tip: There is also a Twitter mentor program for newbies. Educators discuss shaping the future of school. Takes place Thursdays at 7 PM. Find out more here. A chat for those working with younger children. Held on Mondays 2:30 PM and 8 PM EST. Learn more here. For special education (see more here). Takes place on Tuesdays from 9 PM EST. Created by Ditch That Textbook author Matt Miller. The chat focuses on innovative teaching ideas. Takes place on Tuesdays from 9 PM EST. Find out more. Twitter might feel overwhelming but if you give it a chance for a few weeks it will really start to make sense and you will see how it’s so popular with educators. You’ll also notice that Twitter chat hashtags are often used outside of the designated time frame to share resources, ask questions and help each other. The hashtag becomes a community! If you need help at any time you’re on Twitter, just tweet one of our team e.g. @edublogs, @kathleen_morris, @Edublogs_Eugene, or @suewaters. Browse: Do a Twitter search of one of the Twitter chats and check out the information shared during the chat. For example, tell us about any resources, or ideas, you discovered reading through the Twitter chat conversation. TweetDeck: Set up TweetDeck and add a column for a hashtag you want to follow. Leave a comment on this post to share how you went setting up TweetDeck and share your tips for other newbies on using TweetDeck. Join a Twitter Chat. Leave a comment on this post to share what you learned from participating in the Twitter chat. Tell us about any resources, or ideas, you discovered during the chat. Blog Post: Write a blog post about your initial impressions of Twitter Chats. You could include — what you see as obstacles to taking part in Twitter chats, what you have learned from participating in a Twitter chat, or tips for someone new to hashtags or Twitter chats. Don’t forget to leave a comment here with the link to your post. This is my first time on twitter so I was not sure what to search for. I decided to search #4thgrade because its the grade that I currently teach. I was excited to see all the resource that other educators offer. I found some useful teaching strategies that I can’t wait to try them with my students. I set up TweetDeck and used it to explore some of the Twitter chats mentioned above such as #NT2T and #WhatIsSchool. I tried to scroll through all the tweets in these chats on the mobile app before setting up TweetDeck on my laptop, which was a lot easier and more efficient! As Katie mentioned below, it can be a bit overwhelming to scroll through these tweets after the chat has been completed. However, that is the beauty of a PLN! You can give and take what you want from the experience. I never really particularly liked Twitter because I always just get super lost but I’m hoping to become better at it. I checked out #kinderchat because I’m interested in teaching younger grades and was a little overwhelmed but already found so many useful things like a free literacy program to use on the iPads! I’m excited to follow this! I checked out the chat #ditchbook which focuses on innovative ideas from educators and they provide many different discussion. A discussion that they had recently was pertaining to using my maps for education. @AndersonEdTech mentioned how he used to showcase major battles in his US history class and they were able to see images of they looked like then vs today. There were a lot of different comments that showcased how they could show what something looked like to provide students a visual picture. Isn’t it great to lurk and see how other educators are connecting on Twitter? Thanks for sharing this example! I looked into the #edchat hashtag and although it is held on Tuesdays, it is a very active hashtag. There were so many resources that have been shared. One that I found particualry interesting was an article about using educational technology and you “why?” for using it within your classroom. I decided to do a search for #kinderchat and found a great discussion that began with a post about a teacher seeking advice on the best apps to use on iPads for primary use and asked if anyone had a “great model of integrating iPads regularly.” It has seven comments so far. One reply recommends various apps for Language Arts @AppleEDU clips and @MonstersCanRead. Also, for math there is a recommendation to use Moosmath. Another teacher replied and says she uses iPads every day, and that Seesaw is the best tool she has found, which helps to share work, communicate, has activities for direct learning, tracks skills, and more. I explored an #n2t2 chat and was very surprised at how welcoming and accommodating everyone was. It truly felt like people wanted others in the chat to grow from being involved in a PLN. One of my biggest fears in creating a PLN is that I am bothering people, but this chat has shown me that people are excited to be interacting with new individuals. I’m so happy to hear how welcoming everyone was in the chat! I haven’t participated in that chat myself but it’s good to know I can recommend it to others. What a great experience! An interesting conversation that I found in a Twitter chat was about gifted education. One of the discussion questions was if full inclusion would inhibit student growth. I enjoyed reading the tweets about the discussion because users made unique contributions that encouraged the conversation. Setting up TweetDeck seemed to go automatically. I was logged into Twitter when I opened TweetDeck, so it automatically accessed my Twitter account. When using TweetDeck, I noticed 3 things: (1) when I click on a # in a tweet in one of the columns, TweetDeck automatically creates a new search column for that hashtag, (2) the search columns allow a mix of hashtag and non-hashtag terms, so I can narrow my searches better, and (3) when I had pop-ups blocked for Tweetdeck, I had to do a lot of double-clicking to open&close tweets, but the other columns stayed visible; with popups, the overlay has a semi-opaque grey background so I cannot really read the other columns without closing the popup… I haven’t decided which I like best. Interesting observations, Kat. I first found it funny that searching or clicking on a hashtag added a new column. It can be a little annoying if it’s not a hashtag you particularly want to follow. Interesting to hear about the pop ups too. I now prefer to use a mix of Tweetdeck and the regular web version of Twitter. Some people don’t like it but I find the clean interface quite nice to use! I found the #NT2T chat. I found a great article that shows 50 ways to use twitter in the classroom! Twitter chats are one thing I definitely struggle with. I have found one on Middle Grade books that I like (#MGBookclub), but the pace is hard to follow! I’m making this a goal to try and get better at. I agree, sometimes the pace is certainly fast and furious! I’ve heard a few people recently talk about slow Twitter chats. I think the idea is that instead of it all happening within an hour or so, it’s spread out over a few days. So a different question is posted each day. It’s a nice idea. I’ll have to look into any interesting education slow Twitter chats! Oh my gracious me! These chats are fast paced and feel like getting lost down a rabbit hole! I try to click on different pieces, but you can get lost quickly! Or I can. Hopefully with practice I’ll get better at understanding the workings of Twitter. Right now I’m just lurking and have commented on past chats (#tlap – Teach Like a Pirate) but I know my district hosts Twitter chats for literacy so I need to check that out!